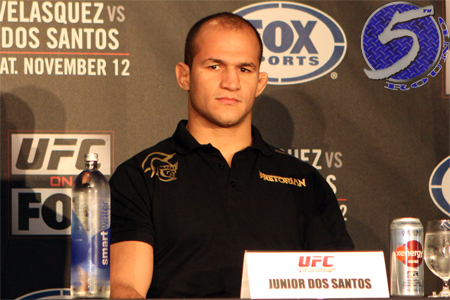 Reigning UFC heavyweight champ Junior dos Santos (Pictured) can enter December’s title defense against Cain Velasquez with a great sense of security. If he happens to lose his crown in the much anticipated rematch, dos Santos knows exactly what to do to secure a trilogy – talk mad smack. After hearing Chael Sonnen chirp his way into a light heavyweight title affair against champ Jon Jones, despite the fact Sonnen hasn’t competed in the 205-pound division in nearly seven years, dos Santos believes the promotion is now handing out top contender monikers based on the buzz a fighter can generate outside of the Octagon, as opposed to what they have accomplished inside of it. “It’s kind of out of order,” dos Santos told FightersOnly of how athletes have been earning championship bouts of late. “Nowadays, the UFC is prioritizing those fights which will sell well. A prime example of this was Chael Sonnen, who sold his fight very well. [Alistair] Overeem has followed the same path. “But, for me, bring it on. I do not run from any challenge, I know I can beat anyone whatsoever. Come whoever comes, I will do my best to go out with a win in the Octagon. Overeem was slated to challenge dos Santos for his hardware at UFC 146, but “The Demolition Man” was forced out of the shootout after registering more than twice the legal limit of testosterone in his system. UFC president Dana White has promised Overeem will get next dibs at the belt once his nine-month suspension is lifted. Overeem initially earned his shot at the throne by steamrolling Brock Lesnar at UFC 141, but has managed to remain in the mix, despite his extended hiatus, with his back-and-forth banter with dos Santos. Dos Santos and Velasquez battle this New Year’s Eve weekend at UFC 155. Overeem is eligible to reapply for licensing exactly two days prior.